Last week, I shared a picture of some reusable glass and metal straws for sale in a local café on my Instagram feed, and it went a tiny bit viral. There were a lot of comments, some commending the reuse of items rather than their disposal, but others shocked, horrified – disgusted even – at the idea of washing something up when it’s been used and reusing it again. I have to say, I was surprised by some of the comments. It had never occurred to me that people would find the idea of a reusable straw unhygienic. It’s not as if plastic straws, made in factories, and stored in warehouses, are sterile. What surprised me most is that most people would think nothing of going into a café or restaurant and using their glassware, mugs or cutlery…even though those things have been used by other people. What is so different about straws? Washing up has been around for centuries, and the human race is still here. Most cafes do have dishwashers that reach hot temperatures, meaning they sterilise their crockery, cutlery and glassware. If people are really concerned about using stuff that other people have touched, they can bring their own. But I have never seen anyone bring their own plate, glass, knife and fork to a restaurant because they are worried about “bodily fluid diseases”. 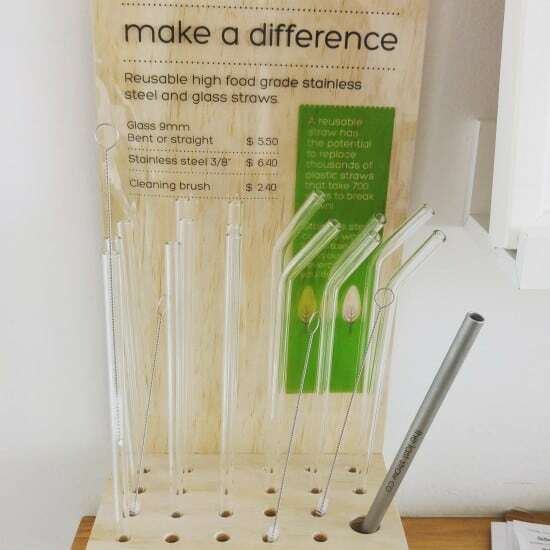 These straws weren’t even being re-used: they were for customers to buy and take home to sterilise to their heart’s content. Of course, I don’t expect everyone to have the same opinion as me. We all see things differently! But I truly expected any disagreement to stem from laziness or cost. Or whether straws are necessary altogether. I realise that bringing a straw is too much effort for some, and that the idea of paying for something when you can use the disposable one for free is new to others. Buying one is obviously more expensive than not buying one, and we all have bills to pay. 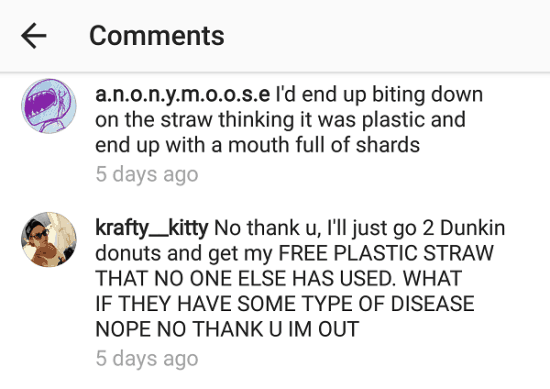 I just didn’t think that people would consider disposable plastic straws to be a better option. Of course, part of me ( a big part of me!) wanted to curl up in a little ball and hide from all the mean comments, or delete the post altogether. But it isn’t about preaching to the converted, is it? What I’m hoping to do is show people new ideas; things they haven’t thought of before. To get them to think about the choices they make, and maybe make better ones in the future. Are reusable straws are really necessary? Well, that’s a personal choice. I know from watching my mother-in-law struggle (after I insisted that she didn’t need the straw) that drinking a frozen daiquiri is pretty difficult without a straw. So is drinking fresh coconut water from a coconut. Children struggle with holding big glasses, and I used to work at a café where an elderly lady would order her cappuccino with a straw, as her hands were too shaky to hold the cup. Whether you chose to avoid daiquiris and drinking coconuts, or get a reusable straw, well, that’s up to you. I have a reusable straw, and whilst I don’t consider it strictly necessary, I love the opportunity it gives me to start conversations. That’s what this is about, after all. Starting conversations. I’m not expecting everyone to see a single photo and change their ways. I’m hoping to plant a seed, or prepare the way for future seeds. I’m hoping to get people thinking, and to question why they make the choices they make. I’d love to tell all those naysayers that plastic straws are made of polypropylene, or plastic number 5, which isn’t commonly recycled. Where it is recycled, it is made into fence posts and garden furniture, or to produce chemicals: it isn’t made into new straws. I’d love to tell them that plastic straws are one of the top 10 items found in beach clean-ups. That they harm wildlife (hasn’t everyone seen the turtle video? ), and create litter. That disposable plastic straws do more harm than good. But would they want to listen? I doubt it. Some people will never change. And actually, that doesn’t matter. Because we don’t need everyone on board with an idea to bring about change. We need far fewer than you might think. We need as little as ten per cent. The tipping point for bringing ideas from the minority into the mainstream can be as little as ten per cent. (Here’s the science to back it up.) That is what keeps me smiling when faced with the naysayers. My goal is not to preach to the converted. But it isn’t to fight, argue, or try to reason with the disbelievers, either. It’s to find those people in the middle ground. In between these two extremes, in the middle ground, lies everyone else. That’s where I was, when I started this journey. The middle ground. I thought I was pretty sustainable, but I didn’t know what I didn’t know. I thought it was all about the recycling. I’d never given much thought to reducing, or reusing, or refusing. Once I did – well, that changed everything. Mixed in with the converts, and the disbelievers, are the people who see this as a great idea: something they hadn’t thought of before, and an easy action to take (be it getting a reusable straw, or simply refusing a plastic one). For every person who makes a better choice, the planet wins. Now I’d love to hear from you! Are there any “green” habits or products that you think are so glaringly obvious to support, and yet you’ve found that others disagree – for reasons you didn’t expect? What reasons? Are there any “green” ideas that at first you weren’t sure about, but over time you’ve changed your mind? What is the craziest reason you’ve heard not to support something that’s better for the planet? How do you deal with naysayers? Where do you sit with reusable straws – do you have one? Anything else you’d like to add? Please tell me your thoughts in the comments below! 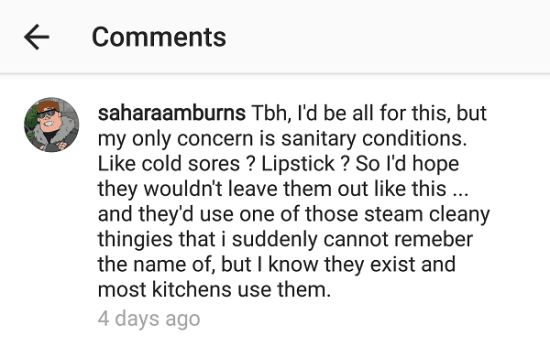 A misguided obsession with hygiene is responsible for a lot on environmental damage. I see plenty of kids drinking from reusable sippy cups so the leap to a reusable straw isn’t that great, but go figure! I wonder though, do people with a rabid fear of saliva abstain from kissing? I agree completely Bernadette! With everything you said! It seems such a no-brainer. Yes I totally agree with this! It’s the same as fruit and veg being wrapped in plastic, people don’t like the idea that someone might have touched their food!! I just checked out your instagram post and I’m both amused and shocked at some of the comments. It’s just a straw, it reads like you’ve told people to slup their drinks off a toilet floor. Completely crazy! I think that sums up how I felt too Amy! I’m surprised at the level of anguish… I would have expected the disinterested people to simply look away. Crazy that people feel so passionately about it! You are right to not worry about it too much Lindsay! Most of these comments look like ‘trolls’ and aren’t very insightful. People can be very closed minded. I would think that glass straws would be a good alternative for cafes, that way people can see through them to see that they are clean (as opposed to a stainless steel straw). I wish more cafes asked if you need a straw before adding one- I was caught out with this recently. Thanks Sarah! It did feel a bit like that, and whilst I wasn’t too worried, it really gave me a taste of what people who receive online abuse actually go through… Not much fun! I know what you mean. It is amazing how many people (men, especially) simply take them out without even using them. But we will get there! With straws, I’d love to see campaigns (maybe as part of PFJ) to have restaurants and cafes only supply straws if people want them – like asking if someone wants sugar in coffee. People obsessed can still have them, no issue. However, those who want to opt out and sometimes forget to order ‘no straw’ and those in the middle who don’t care are more likely to say no and maybe think a little. I think it has potential to significantly reduce straw numbers. Hi Mel, thanks for your comment! I think that is the next step, that’s what happened with plastic bags in the UK before the ban. Shops stopped just handing them out, and you’d have to ask, or help yourself. Then, if they are using less, maybe they will switch to paper/bamboo and reusables. There are a few anti-straw campaigns about the place – I’ll have to do a blog post about them all sometime! Question is, what got the shops to stop handing out plastic bags? And how do we get there with straws? I am planning to put the idea to a couple local Councils where I’ve had a few small wins. If there’s a business reason for change… only thing I can think of is extra advertising thru Council during PFJ. Any other ideas? I think people have been aware of the environmental impacts of bags for a long time, and also know that there is a viable alternative – reusable shopping bags. I can remember local supermarkets in the UK having reusable bags from way back – as long as I can remember. Easily 20 years. But straws are different. People don’t see them as waste or an environmental problem in the same way – and they don’t realise there is a reusable alternative. Education, awareness… that takes time. Exactly Stephanie! Daiquiris and coconuts aside ;) The earth will continue to spin without them! Things I thought of as crazy – diva cups, no shampoo, and zero waste. Now, prefer the eco options over the others anyway and zero / minimal waste came as a good accident. Thanks for these Mel! When I wrote that bit, I thought to myself – washable reusable sanitary pads! I have had a Diva cup since 2003, and I have always thought that reusable nappies made complete sense, but for some reason the pads did not! It took me about 2 years of plastic-free living to actually embrace them and get one. Not that I used disposables, but sometimes in the night in the first day or two my Diva cup leaks (basically fills up) – and that makes a HUGE mess. So it is crazy that I just put up with that for so long! Why did you think zero waste was crazy?! Is it the “zero” part? Yah, I’m still adjusting to the pads for the same reason. Zero waste just seemed so impossible and only for people who were a bit extreme. I don’t think I even thought of it as a goal, it just sorta happened as I slowly ticked off one item at a time on my green list (still have more on my green list but very little landfill. It was a lot easier than I ever expected to eliminate most of my landfill and keep the habits. I can relate to that! I didn’t read Bea Johnson’s book until last year – long after I was zero waste, because it always seemed extreme (based solely on the front cover – they do say you shouldn’t judge books by their covers)! It was only when I realised that I was actually living zero waste that I realised it isn’t so extreme after all. Thankfully, in Europe (or at least in Ireland), the use of plastic straws isn’t so mahoosive like in the US. I noticed that is the American brands of restaurants that have it somehow embedded in them (Eddie Rocket’s, TGI’s, McDonald’s). Often they (thankfully) offer an option for people to take it with their meal (available at the till) rather than being forced upon. Of course, bars are different to restaurants, you get a straw pretty much automatically….which is annoying and even asking for a drink without a straw is very surprising to the barmen. Sigh. But as you said, it does start conversation and that’s the main thing!! Here in Australia they are pretty pervasive Zdenka : ( I think because Australia has such a healthy, outdoors lifestyle, everyone drinks green juice and smoothies – with a straw! I have found that having a reusable straw sometimes helps overcome the incomprehension that I might not want a straw. It becomes, “oh, you do want a straw but you have your own.” Which is somehow more understandable. On occasions I still order a drink and refuse a straw (or more likely, someone in my group will, and I will refuse straws on everyone’s behalf) only to be given one. In this case I always make the point to send it back. I know that it is likely to go in the bin, but I want to make the point that I really don’t want a straw and that I find them completely unacceptable. Haha! I can see you clearly at that bar :))) And yes, I meant to say US and Australia! It’s very surprising because I would have thought that in Oz, where people are outdoor-oriented and beach-loving, they would have copped it!! People, eh?! My boyfriend enjoys his drink better with a straw (I know..eye roll!) but when we talked about it he said that the glass straw sounds very nice…so I’m in the process of getting some for him..it’s the little things. It was a storm! ;) Yes, as this way of living becomes more normal, I am sure people start to accept and even embrace it. Thank you so much for your kind words! That is an amazing achievement in four months, well done! Sorry, on a roll…. one that I received massive resistance to was using real plates etc at a weekend family reunion. Many relatives are committed to plastic and (gasp) styrofoam divider plates. I even volunteered to do all the dishes for anyone who wanted to opt for real plates etc. Of 35 ppl, we had the range of support and 3 plate options for the main meal (yep, real, disposable pastic, or styrofoam). Still a win. Overall less waste and lots of discussions. Haha, roll away! Woah, I would not expect that people would prefer styrofoam?! Do they know that stuff is toxic?! Good for you on offering to do the washing up. Maybe next time, more people (or everyone) will go for option one! Goodness! Good on you for having such a positive reaction! Yes, that is the tipping point. That’s when the “crazy” ideas start to get accepted as normal, and paves the way for mainstream. It’s funny when we adopt things, thinking that we are making a compromise or that it won’t be as good, only to find it is better! A nice surprise, and then a – can’t believe I didn’t do this before! I’ve added that to my blog post list! I’d love to dumpster dive, but I’d be a fussy diver – I don’t want to eat processed junk! Whereabouts did you live – I didn’t know it was illegal (although, it doesn’t surprise me). Just looked at your Instagram post. Over 5,000 likes is pretty awesome! According to the statistics, it had 137k impressions, and reached 133k people. That’s a huge amount! Just wanted to say that my three children loooove their stainless steel straws and that they are big enough to use for smoothies too!! That’s great Margit! Reusable straws definitely have a place with kids. As a kid I had one of those reusable bendy straws – made of plastic! (And PVC probably – yuck.) Yours sound much better! Thank you for putting the idea out there among those who have never heard of or seen a reusable straw, and taking the flack. Plastic straws and their wrappers litter the beach just about every time we go, which is several times a week. The straws never decompose and they are ingested by wildlife. Many of the negative comments were probably the first reactions of people who had never seen or heard of reusable straws. I’m hoping some will have a change of heart as they think and hear more about them. As for us, we love our stainless steel straws and enjoy talking to others about why we use them. Thanks for your comment Cynthia, and for picking up litter where you see it. I agree, whenever I pick up litter, there will be a straw. 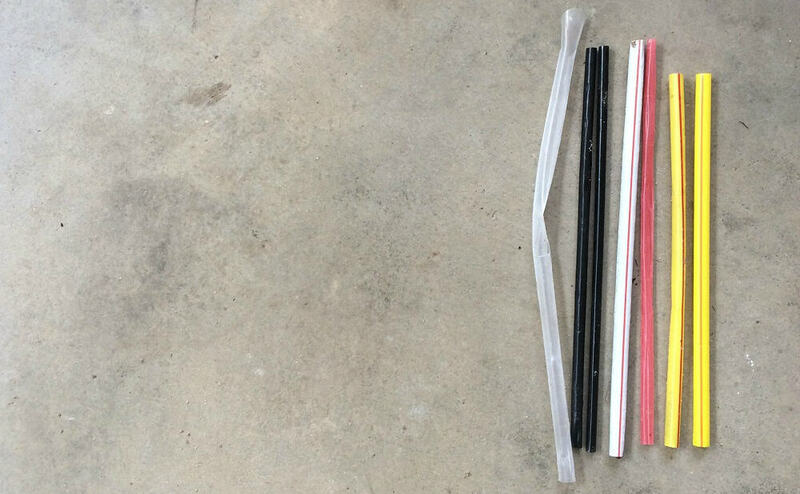 Drinking straws used to be made of waxed paper – I wonder what happened to that? I can sort-of understand the hygiene argument on the basis that the inside of a straw is likely to be pretty difficult to wash, unlike normal crockery or glasses, and might cumulate some sort of bugs in a less-than-100% perfect washing-up system. Possibly, but I’m sure most people at home don’t have 100% perfect washing up systems. Most industrial dishwashers get pretty hot! At least you got people talking about it! That’s awesome how much attention came from that. I’m surprised by the negative comments. My 20 yr. old daughter is a clean freak (doesn’t think I wash our dishes well enough etc.) and yet when I’ve asked her on occasion to use one of our reusable straws with her Starbucks, she hasn’t complained or balked once about it. 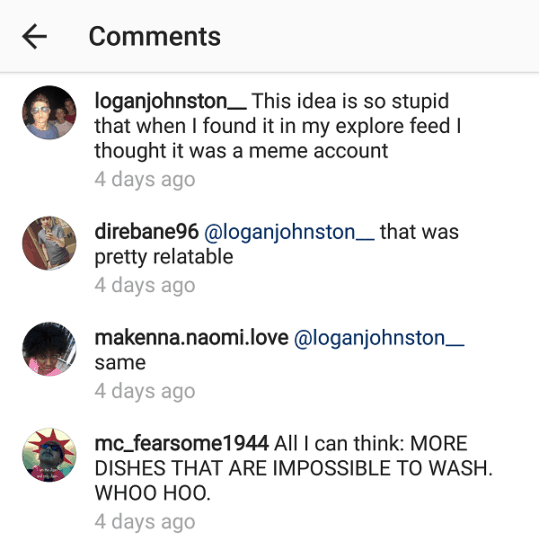 I’m surprised at the comments about hygiene, I mean at restaurants they have metal utensils, do those people not put the forks and spoons in their mouths? If they don’t I’m very curious of how they eat! I’d love to use them personally. I think it’s ridiculous that people think single-use items are more sanitary than BYO! What about the barista or bartender that grabs your straw by the tip with their dirty hands? You’re putting your mouth on that! That’s great Sally! Your mum is wrong – whilst it IS a battle (or it feels like that sometimes! ), but you can only lose if you give in. And we are not giving in! If all the people who “would” change, but think it is a losing battle, actually did change – imagine how much better everything would be! Plastic hasn’t always been popular. It only became popular in the 1960s, before the environmental impacts were understood. Now we know, we can do better. Thanks for being part of the team! We are on the winning side, I promise! This is very topical for me. We went to a bar in Brunswick last night where we were given drinks with straws. I wasn’t quick enough to refuse the straws but have since emailed them requesting that they ask people if they want a straw rather than assume we do. Hopefully they will take it on! I assure you, that quick-fire response gets quicker the more times you are given a straw against your will! Eventually you will get to the point where you march behind the bar and watch them make your drink, arms crossed, to avoid the straw! In my village the businesses have agreed to phase out plastic straws, so it can be done! Next on the list is plastic bags. Blackheath, in the World Heritage listed Blue Mountains, Australia, has become the world’s first town in which all the shopfront businesses have agreed to phase out plastic straws. Thirty businesses – all the cafes, restaurants, bakeries, grocery shops, delicatessens, takeaways, service stations and pubs – now display signage indicating that they will only offer straws on request. Some businesses, like The Piedmont Inn, have already replaced plastic straws with paper straws! A community bulk buy and sponsorship by Aardvark paper straws and Australian distributor Green Pack means that when stocks of plastic straws are depleted, all the other businesses in this popular tourist destination will also offer paper straws instead of plastic. That is absolutely awesome Ness, thank you so much for sharing! I’ve just been reading that link now. I’m feeling inspired to try to get some local cafes here to do the same thing! Do you know Lis personally? I’d love to chat to her about it! I’m always astonished at the number of people who never turn their work computers off because it takes ‘too long’ for them to re-boot in the morning… O.o Why not arrive a couple minutes earlier, or use the time to make a cup of tea if it takes that long? It is incomprehensible to me. That is so true Lola! Like you say, can people be that eager to start work that they can’t switch their computer on, and then make a cup of tea and chat to colleagues for two minutes?! It’s not as if it will translate to going home 2 minutes earlier! My work computer takes AGES to log on but I go and make myself a coffee and go to the loo while it wakes up! Great idea. Some drinks need straws and reusable works for me. I love reading your ideas and suggestions … keep up the good work. I’m surprised, i like the idea, everyone uses the same cups day in day out and we have a thing called an immune system anyway to deal with bacteria (something we often forget!). Just put them in with the rest of the dishes to wash, i don’t see a problem. My girlfriend has quite sensitive teeth so is always using straws so I’ll be getting her one of these! I really enjoyed reading your article.There is a percentage (I think it is 10-15%) of people who won’t change, the wall goes up immediately and they justify their actions/ways mainly to themselves. You will not get anywhere with these closed minded individuals. You are right not to waste your breath or energy. Plant the seed hopefully then move on. But they are only 10-15% and when consumer culture shifts they will be following along with the rest. But it takes innovators and change agents like yourself. Thank you! This is a very interesting article that sadly, does not surprise me. We now live in a selfish society that overall will not accept the environmental damage that each person can and does inflict on the planet … and a society where many people also think things have to be brand new every time they use them for fear of bacterial infections killing them! This is not helped by a recent video I saw where hidden cameras showed hotel staff not properly cleaning drinks glasses in hotel rooms. Your 10% figure is not one I was aware of, though and that gives me hope. When it comes to straws I am in that 10%. I used to buy straws for my children when they were little but now don’t and I also now reject them in restaurants etc. I am in the camp that in the vast majority of cases we don’t need straws. I managed to reach adulthood without having to drink with straws. Children do not need to drink from their juice from tetrapaks with straws because what is wrong with a cup? And for elderly or disabled people there are alternatives such as sippy cups that in the vast majority of cases would work just fine … and in fact be easier to use. I remember my poor elderly mother in law struggling to keep the straw still enough to get it in her mouth so we switched to one of the boys old sippy cups and the problem was solved. And in those few instances when a straw is deemed “useful” (I suppose I can add your frozen drink or coconut water here) then a reusable one makes perfect sense. Thanks so much for sharing, Rosie :) I’d completely forgotten about sippy cups but goodness – aren’t they a great invention?! When I see people drinking hot drinks with plastic straws it does make me wince a little – straws are not designed to be heat proof and I do wonder about the chemicals leaching from the plastic. I think the plastic-free movement has definitely got the conversation started around why we even give straws out with everything. I’m increasingly coming across places who only offer straws on request. I just don’t get the insistence that something reusable is bound to be dirty! I walk my dogs daily and always pick up straws I find and bin them.We live near the ocean and when it rains they get washed into the Bay.I am with you every step of the way!! I guess they are harder to clean than cups or crockery, because you’d need some special instrument to get down inside the straw and ensure there’s no sugary residue creating a home for bugs. It’s also much harder to dry than a cup or a plate. I never use a straw. Perhaps the better idea is a ban! Lindsay, I too get very upset when people don’t see what I see, but it’s ok, you’re never going to change everyone. Like you said, as long as a small minority see it! I wish people would ask if you wanted a straw because I’ve many times ordered drinks that I didn’t know would even come with a straw and when they hand it to me, it’s too late. If I take it out, they’re only going to toss it anyway. These people who have a problem with straws don’t have a problem with putting a restaurant fork in their mouth, why a problem with a straw. Many years ago, we used to buy milkshakes in metal cups with metal straws. I don’t remember there being an uproar then. I have found that if something inconveniences people for more than about 3 seconds, then a lot of people will not bother. Don’t worry about the naysayers, there’s enough of us out there that agree with you! Thanks for your lovely comment :) It was definitely a shock! I hadn’t even considered half of these arguments! But it is good to be challenged sometimes, or we are in danger of being in our own little bubbles. Clearly there is more work to be done! People never cease to amaze me to be honest. Sometimes I fell a little bit gutted over stuff like this but as you say we are not here to preach to the converted and change in culture is nicer simple or easy. The other day I’d commented that a supermarket would be wise to start considering alternatives to plastic packaging ahead of when plastic bottles ar banned in the uk and a young lad came back with ‘let’s hope that never happens’. It took me aback because I just forget sometimes that people would even think such things! Onwards and upwards! It’s definitely good to get out of our bubble – even if we’d rather be in it! WA has just announced a bag ban stating next July and some of the comments are mind-blowing. People thinking it’s all a scam so the supermarkets can make more money from selling bin liners; people arguing that because everyone will now buy bin liners there will be exactly the same amount of plastic as before; people literally panicking about how they will manage. Change isn’t always easy… but we will push for it regardless! Reusable chopsticks are great! So much better than all those single use ones, wrapped in paper for extra waste! I really think that some of the people that commented thought that the cafe was going to wash the reusable straw and give it to someone else to use.They dont get the concept ofbring uour own.. I think reusable straws are a good idea. What is up with some people?? Using a metal or glass straw is no more disgusting than using a reusable glass, cup or cutlery! I’m sure the cafes and restaurants would wash them appropriately! Plastic straws that end up in the ocean, break down into micro-plastic, that then ends up inside the fish that these same ‘plastic straw’ people eat…so there is some sort of justice in the world I suppose! I know I would rather keep our oceans and our marine life, plastic free. When I bought my reusable straw, my sister and a friend were with me. They ended up buying their own too without me saying anything – like you said, there are people in the middle ground who just have no idea about this stuff and no strong opinion against it. They thought it was pretty cool in fact! I just came back from Bali where I did lots of snorkeling. The amount of rubbish in the water in some areas is quite depressing. One little budget hotel we stayed at in Amed used glass straws, cloth napkins and supplied treated water (instead of bottled). It’s such a shame that this isn’t the norm every where (work wide). Thank you for sharing about this! Your awesome!